‘Masarap makikain sa kapitbahay!’ or in this case, ‘Masarap kumain ng galing sa kapitbahay!’. My Chinese neighbor and good friend, Myze Ngo, gave me a warm bowl of this Makut Theng or the Chinese version of our nilagang buto-buto. What I found immersed in the the very tasty pork broth was an interesting mix of ingredients like some fall-off-the bones pork ribs, ginger, bola-bola, black mushrooms, gabi and lettuce. I ate it with my sawsawan of hoisin sauce and a bit of hot chillies. Winner! Myze tells me, these fares are usually found in authentic small Chinese canteens, as she refers to their medium-sized eateries, which usually thrive in places like Chinatown, Banawe, etc. Can I just say, I am forever delighted sampling authentic Chinese food, it’s a pleasant temporary departure from the Chinese food adjusted to the Filipino palate we usually experience. To Myze, chin toh sya! OMG i miss home-cooked meals!!! waaaah!!!! tasted this one long long time ago. please ask your neighbor friend the recipe and how they cook this. also, saan nakakabili ng bola bola? Will give it to you when I get it. Thanks! u can buy the bola bola at any supermarket or suki market. use fish or squid balll the perfect match. in my/sg it’s called bak kut teh it’s pork ribs/meat/innards cooked in an herbal broth and has mushrooms and lettuce. it’s get a bit of getting used to because of the herbal taste but it’s yummy! 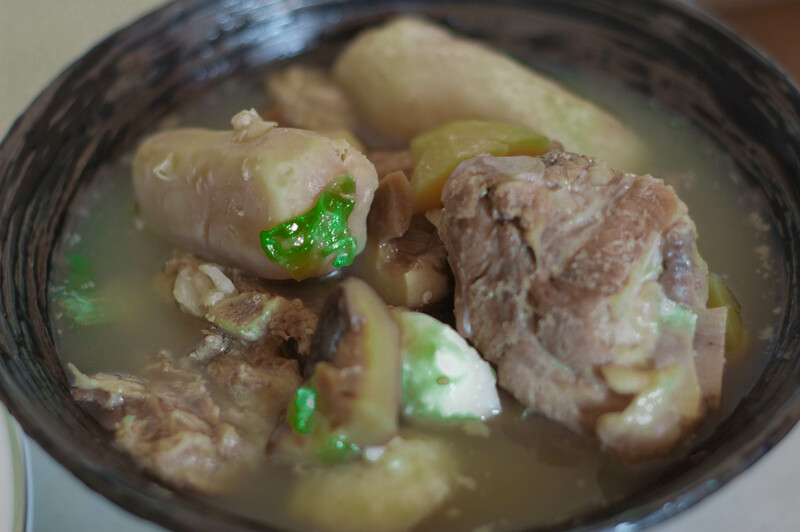 sawsawan is usually chopped garlic and siling labuyo with a very light soy. Hi, Shella! That sounds pretty interesting. I should try that.